The Look SunSmart Program raises awareness on how to properly dress (or look) to reduce the risk of developing skin cancer by protecting our eyes and other parts of our bodies from the sun through clothing, hats and protective eyewear. Sunglasses should be worn all-year long – not just in the summer. The same melanin producing cells in the skin appear in the eye so unprotected UV rays exposure to the eye can cause melanoma of the eye or ocular melanoma. Doctors recommend wearing sunglasses all year round to protect your eyes and the surrounding skin areas. Hats are very important especially for those with thinning hair. The wider the brim the better but any hat with a bill to shield the sun rays from your face is good. UPF50+ (Ultraviolet Protection Factor) clothing is preferable but in any case wearing long sleeves and long pants is a good alternative. Darker colors protect you better than lighter ones. Obviously, the tighter the weave of the fabric the better protection as well. 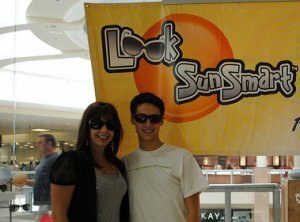 Interested in learning more about our Look SunSmart program? We work with eye care professionals, clothing manufacturers and retailers to provide information and support so that we can work as a team to educate consumers about the importance of skin protection. Help others understand the importance of eye and skin protection through sunglasses and protective clothing. Join the Live SunSmart Foundation as an advocate for our Look SunSmart program and receive free tools you can use to help educate others on the merits of living sunsmart. Sign up now to become an advocate of our Look SunSmart Program. For more information, contact us or give us a call at 973-744-3557. We all know to wear sunscreen to prevent sunburns and skin cancer, but what about protecting your hair? Hint: Wide brimmed hats are back in!